This Medieval Pottage Stew is simply another name for a thick, rich, soup often made by Peasants during the Middle Ages. 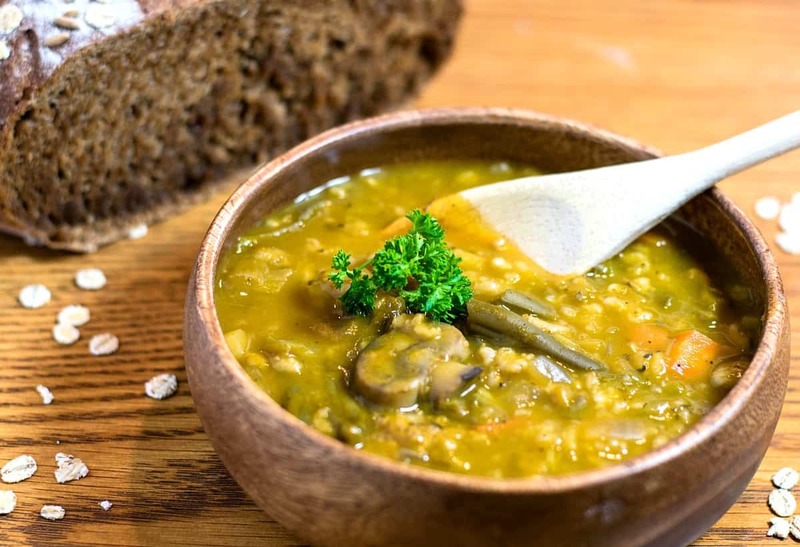 Since peasants were poor, and couldn’t afford meat, they used whatever vegetables and grains they could grow to make this soup, often served with a dark, crusty loaf of bread. So why the sudden look into Medieval eating habits? Have you ever really thought about the Middle Ages? It’s actually kind of ironic when you compare it to today. The wealthy could afford all kinds of meat, anytime they wanted it, along with the finest wine, ale, a variety of cheeses, and even the lighter, tastier, loaves of wheat bread. And vegetables? They were considered peasant food, definitely not to be trusted. Meanwhile, the lowly peasants scrounged for every last crumb they could find. They worked from sunup to sundown, burning around 4,000 calories a day, managing the king’s land in exchange for a small plot to grow their own barley and rye. The wives and daughters managed the gardens and maybe a stray animal or two in hopes of a few eggs, or a little milk to make their own cheese. Their diet was predominantly vegetarian with the majority of their calories coming from their dark, dense, loves of barley bread, or rye. There were no potatoes or tomatoes yet, so their main vegetable crops were turnips, parsnips, leeks, onions, and cabbage. They would chop all these vegetables into a big cauldron and boil them in whatever broth they could make from stray bones and vegetable scraps. The stew would then be thickened by adding oats or barley, and spiced with whatever herbs grew in their garden. This Medieval Pottage Stew, along with their bread would be their main meal, along with cheese if they could afford it. And who do you think was healthier? The poor scrawny peasants? Or the rich and wealthy lords and kings? The wealthy are usually depicted in paintings and drawings as being OBESE. King Henry VIII was said to have been so large they needed a hoist just to get him on his horse. He suffered from gout, leg ulcers, diabetes, and weighed about 400lbs when he died at the ripe old age of 55. The peasants predominantly lived on a HIGH CARB diet, while the wealthy predominantly lived on a HIGH PROTEIN, HIGH FAT diet. Many of us today truly ARE eating like the Kings and Queens of old, and suffering the same diseases they did. Take a note – eat like a peasant. So with all that in mind, I wanted to try and recreate a typical meal that a Medieval Peasant might have made. So get out your cauldron and let’s get started. In a large stew pot, add 1 cup of diced carrots, 1 cup of diced parsnips, 1 cup of diced onion, and 1 cup of diced turnips. After 10-15 minutes, add 1 cup diced leeks, 1 cup sliced mushrooms, 1 cup fresh green beans (or use a 15oz can, rinsed and drained), and 1-2 cups of chopped cabbage (I used Napa). Let that simmer for a few minutes and then add 2 quarts of low sodium veggie broth. Season with 1 large bay leaf, ½ tsp dried thyme, ½ dried rosemary, ½ tsp rubbed sage, ½ ground pepper, and ¾ tsp salt. Bring the soup to a boil, and then lower the heat to LOW and cover. Continue simmering for another 20-30 minutes, or until grains are cooked. Add any additional seasoning if desired, 1 Tbs of balsamic vinegar, and remove bay leaf before serving. Pairs well with a nice, crusty loaf of Rustic Bread. I am still tweaking the Bread Recipe I used. I used a combination of Bread Flour, Whole Wheat Flour, Rye Flour, and Molasses and then sprinkled Barley Flakes and Rye Seeds on it before baking. It was’;t bad, but the crumb still needs some work. This stew is literally chok-FULL of the good stuff. If you try it I’d love your honest opinion. This recipe DOES make a lot but I’m sure it can easily be frozen for later. Keep those comments coming and remember…. EAT LIKE A PEASANT !! 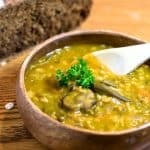 This Medieval Pottage Stew is simply another name for a thick, rich, soup often made by Peasants during the Middle Ages, chock-full of vegetables and grains . Bring to a boil, lower heat, and cover. Simmer for 30 minutes. I have some whole oats that I bet would work great for this. I’ll put them in sooner to give them time to soften. Tell me, I signed up to be a patron on Protheon, how do I get to see the page without the ads now? Hi Sue! I just sent you an invite to my private Facebook Page. Be sure and check your spam folder. Oh, and I know EXACTLY what The Gerson Therapy is. Hope you have the best of luck with that. Everything I post n my Patreon page is Ad Free…so it’s just another way of getting the recipe, only without the ads. You’ll also see the same recipe posted in our FB Group. This sounds delicious. I love the idea of taking cups of veggies you already have and combining them with spices and a bit of grains. Will definitely try this. I can tell you’re not a historian. First of all, medieval peasants suffered greatly from a lack of lipids, protein, and vitamins A, C, and D. The idea that medieval peasants were healthier and lived longer than nobles is complete and utter bull. Peasants were lucky to live into their 50’s.They would have given their eyeteeth to be able to throw a piece of salt pork or bacon into the pot with their pottage. Pottage itself consisted of sprouted barley grains that were thrown into a pot of water. They could either make pottage out of this or they could pour of the water and drink it sweetened with honey, or they could ferment it into beer. Peas and beans were added and any vegetable or greens at hand would be added to the pot, including things like nuts, fruit ( fruit would be cooked because they thought they were bad for you raw) strawberry and primrose greens. Winter was when pottage was mostly peas and barley. If you lived on a medieval peasants diet you would be very unhealthy. Stop spreading lies to support you worldview. What a thoughtful comment…..thank you so much. And I suppose you know all this because…..you ARE a historian? Can I see any papers you’ve published? I’d love to read them. I agree, life in the middle ages was hard, and yes – many people died from disease and malnutrition……. But the point is….their mainly vegetarian diet, using whole unprocessed foods, with little to no salt, sugar, or meat was indeed WAY healthier than the garbage we eat today called the Standard American Diet. I’m making a light medieval-themed supper for a group tomorrow night, and this pottage as well as a Medieval barley bread from another site (It has ale and honey in it too). I also have several bottles of mead from a local winery, and some blackberry wine too – no idea of the blackberry is at all authentic to the time, but it’s so good! I’ll get a few jugs of cider. What about butter for the bread? Or maybe just some honey? or honey-butter? A medieval peasants pottage was also thin, not thick. 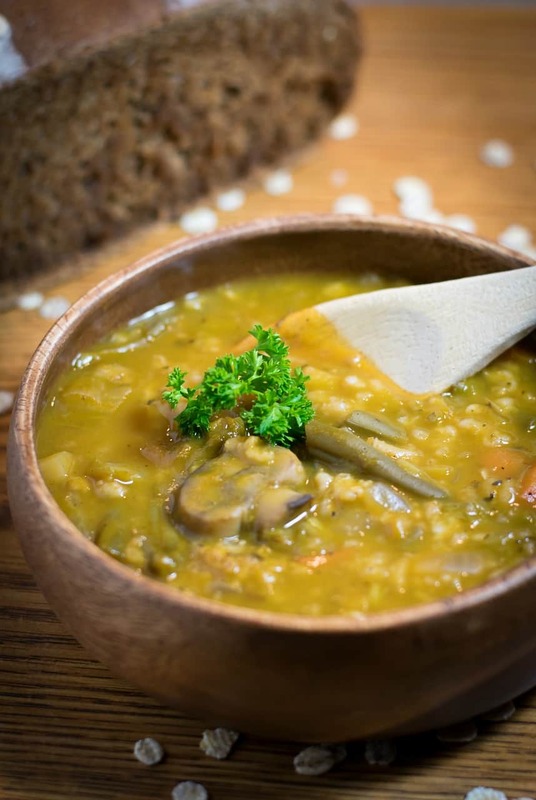 The medieval peasants diet consisted of bread, pottage, porridge, and ale. The bread was made from “maslin” because wheat went almost exclusively to market. Maslin was wheat and barley or wheat and rye, it was baked into about a 4lb loaf. Poorer families didn’t eat bread because pottage didn’t require flour. Flour was milled exclusively by the lord of the manor, as was all the baking. The baker baked all bread in the village so that all the fees would go to the lord. If you are going to pass of something as historical you should do a little research. Your recipe would be more like frumenty or morrews and would (contrary to you) be made by the wealthy. I like your recipe, I’m going to try it, although I’m not sure they would have had mushrooms in the middle ages! They would, however, have added what we call weeds nowadays, like fat hen, chick weed, and hairy bitterness. I like foraging, so I will add some of these to your recipe . This dish looks delicious. I’ve gotten very into using rolled oats of late (mixed with ground, raw nuts they make awesome gluten-free croutons, basically just a savory version of granola!) and I love the idea of adding them to soup, so many Americans only thick of using oats in oatmeal…or oatmeal cookies! This sounds like a great way to incorporate this healthful ingredient into other dishes, thanks! This is not a medieval pottage stew but more like a Modern day stew. If you want to associate it to something more historically accurate, this could be a Victorian era stew that was eaten by the upper and maybe middle classes if you leave out the red wine. I have to agree with Medieval Matt on the history of pottage. Medieval peasants didn’t have a lot to work with – just water and some grains and maybe peas. Anything else they could add to the pottage was a bonus but it was not consistent. They also drank a lot of ale because they mostly had access to grains to make it and they sure as hell did not drink red wine, which is in your recipe. Peasants were the most malnourished in medieval society but everybody in medieval times had a shorter lifespan in general because there was no sanitation systems, absolutely zero understanding of medical science and lack of clean water. For a lot of people, you were lucky if you made it past 40. While the standard american diet is not healthy at all, a strictly high carb diet is not healthy either. Peasants worked all day so they had the carbs to burn the calories but they didn’t have other essential nutrients from other sources so they suffered from scurvy and vitamin d deficiency. So to say that medieval peasants fared better in diet than the rich is wrong BUT in the modern context, if you compared eating standards of poor communities and the upper class in countries such as Guatemala or El Salvador, this assumption is more correct. For upperclass people, fresh foods or street foods were looked down upon negatively because pre-packaged and processed foods are social status items for the well to do folks. Being able to shop in a big grocery store is a social status thing. They wanted to own a piece of industrial progress and show it off. What they don’t get is that the poor folks are probably eating better than the rich guy eating a packaged hot dogs and little debbie. Lol. The lords and kings. Medieval peasants were notoriously malnourished and lacked sufficient vitamins A, C, and D. Just because there’s no meat or dairy in it doesn’t mean it’s an awesome diet. Dear lord, some people get awful feisty about a recipe. Anyway, I’m just curious if you’ve made this a day before serving and if it holds up well or needs to be served the day of considering the grains? Thx! You know, I think it would be ok but not totally sure? Just made this and it is DELICIOUS!! I used bulgur instead of barley because I had it on hand, but otherwise stuck to the recipe. I am wondering – could I use this recipe in a crock pot? If so, what would recommend for the amount of time? We’re hoping to make this for my medieval history class and a slow cooker version of this would be amazing! I bet you could – but you’ll have to experiment a little on the times. How sad that people are so nit-picky. Just enjoy the recipe!!!! It sounds wonderful. Plan on making when I get the ingredients. Always looking for great hearty soups! …Who told you this, or have you just got back from Wikipaedo? That said, it’s not a “Medieval Pottage” recipe. Seems it’d have barley rather than our porridge oats we buy, and certainly no red wine, but you’re still a cry-baby Matt. There’s nothing wrong with the recipe per se. It’s the making of sweeping statements about medieval diets that various people are commenting on. The malnourished and therefore disgruntled ghosts of medieval times past have come back to troll the internet in search of anachronistic inerrancies found in 21st century benign and friendly recipe posts. Hilarious albeit pathetic. The soup was delicious. Thanks for the recipe.